The verdant Central Valley is known more for its agricultural productivity than for tourist destinations, but there’s still plenty of vacation fun to be found here. From the laid-back state capitol (Sacramento) and the razzle-dazzle excitement of Cache Creek Casino north of it to the kitschy McKittrick Penny Bar down south near Bakersfield (where over one million pennies cover ever imaginable surface), there is truly something for everyone in the Central Valley. Since agriculture is so much a part of California’s Central Valley, you might want to plan your vacation to coincide with one of the many of the area’s festivals that revolve around the wonderful food, beer and wine produced here. Events like this often provide a more local perspective of the area’s culture, and what’s not to love about learning via food, beer and wine tasting? Check out this festival list to see what’s happening when you plan to visit. 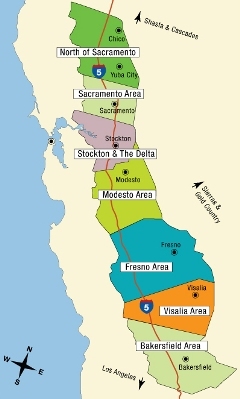 Houseboating and whitewater rafting on the region’s many rivers and waterways (the Kern and Stanislaus Rivers, Lake Don Pedro and the California Delta, near Stockton, for example) provide ideal summer recreation, and there are also a couple of popular wine regions in the area (Lodi, known for its Zinfandels, and the Madera Wine Trail, near Fresno). There’s a lot to do in Sacramento, beginning with the impressive Renaissance Revival-style capitol building and its lovely grounds. You won’t want to miss the historic Old Town waterfront and the reconstructed 1846 Sutter’s Fort located there, and Crocker Museum and Stanford Mansion are also quite impressive. Nicknamed “The City of Trees,” the Golden State’s capitol city boasts numerous parks, and outdoor enthusiasts will enjoy the city’s hiking, mountain biking, rafting and fishing opportunities. A unique way to view part of this area’s natural beauty is traveling aboard the Sierra Railroad Dinner Train, enjoying a delicious meal and entertainment at the same time. Formed in 1897 to connect the Central Valley and Gold Country, the Sierra is the third oldest railroad in North America and is still used to haul freight and even to make a Hollywood movie now and again! The train station is in Oakdale, which is near Modesto and about halfway between Sacramento and Yosemite National Park. A most unique landscape can be found in the Tehachapi-Mojave Wind Resource Area on the valley’s southernmost tip, where roughly 5,000 wind turbines generate 1.3 million kilowatt hours of electricity per year (enough to serve half a million residents). The best time to see these turbines spinning is in the late afternoon when the hot winds blow from the Mojave Desert. Also of interest is the Tehachapi Museum, exhibiting models of the Ice Age animals that once roamed here, tools used by the area’s indigenous Indian population and relics from the influential ranching and mining industries. At the region’s northern tip, Chico (one of USA Today’s “Top 10 Artistic Cities”) has a vibrant downtown with charming shops and restaurants. Chico is also home to Bidwell Park, which is the largest municipal park west of the Mississippi and a must-see if you’re in the area. Fairfield/Suisun offers some fun things for school-age children: the Travis Air Force and Western Railway Museums, plus touring the Jelly Belly Candy Company. Fresno, located at roughly the center of the valley, is home to several museums, as well, and the Forestiere Underground Gardens (an expansive subterranean arboretum created between 1906-1946 by Baldasare Forestiere and now on the National Historic Places list) is a must-see.